It is our great pleasure to introduce the 2018 edition of the Philippine Investment Guide of Ocampo & Suralvo Law Offices (OS Law). OS Law is the DFDL collaborating firm in the Philippines. 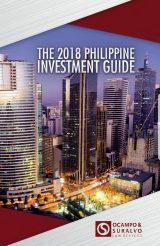 In this guide we aim to help investors from across the globe in reaping the vast benefits of doing business in the Philippines, and making the most of the vast opportunities the country offers, with its large domestic market, highly educated work force and booming economy. This guide provides important information on laws governing foreign ownership restrictions, taxation, labor laws, data privacy rules, immigration, competition law, and many others. It has special sections on energy and power, infrastructure, mining and banking.